No Finest Resort Myrtle Beach ,. fabuleux très en peluche et propre, bord de l'océan. BAHAMA SANDS / Atlantic Breezes vous souhaite la bienvenue dans l'Atlantic Breeze situé en bord de mer au 1321 South Ocean Blvd, dans le croissant de No Myrtle Beach, dans l'un des plus beaux quartiers de NMB. Atlantic Breeze est l'une des plus récentes propriétés de Ocean Drive. et c’est une unité très luxueuse avec toutes les commodités que vous recherchez. Unité est située au 7ème étage directement sur le bord de mer, avec vue à 180 degrés imprenable sur le magnifique Océan Atlantique, et plages de sable blanc de sucre Aucune Myrtle Beach. L'unité est située dans le coin sud de la propriété et comprend une connexion Wi-Fi gratuite, une laveuse et une sécheuse, un lave-vaisselle, une baignoire à jets dans la salle de bain principale et un balcon en bord de mer avec des panneaux de verre transparent entre vous et les vues spectaculaires. La propriété dispose d'une piscine intérieure et extérieure. La piscine couverte est chauffée toute l'année. Il y a aussi une rivière paresseuse et un bain à remous. Il y a aussi 3 autres balcons privés, un hors de chaque chambre dans ce condo, chacune avec vue sur l'océan il y a une télévision dans chaque chambre ainsi qu'un écran plat de 55 pouces dans le salon. Cette partie de la plage est très large et est situé dans le périmètre d'un quartier résidentiel. Profitez du meilleur de ce que Myrtle Beach a à offrir toute l'année dans cette unité bien équipée très spécial. Nous serions ravis de vous accueillir et vous offrir très attrayant prix toute l'année. (Cette propriété ne permet pas des bateaux, des remorques, ni motos. Vous ne pouvez avoir un permis de stationnement pour un maximum de 2 véhicules. animaux aussi ne sont pas autorisés, ni est la décharge de feux d'artifice de la propriété, pas plus que l'utilisation de pointeurs laser.) CE BÂTIMENT ET CETTE UNITÉ NE PERMET PAS DE FUMER ET EST DÉSIGNÉ UNE UNITÉ NON-FUMEUR. Cette unité a une exigence d'âge minimum de 25 ans d'âge et la réservation est à un groupe d'individus alors toutes les personnes d'un groupe doivent être âgés de plus de 25 ans. Cela ne vaut pas pour la mère et les pères avec les enfants mais dans ces cas, les parents doivent avoir plus de 25 ans. Contrat de location est nécessaire! Disappointed in this unit. There was only 1 dvd player and it didn't work. There were no stoppers in the bath tubs. The handle for the sliding glass door was laying on top of the entertainment center. The oven door wouldn't open. However the property was nice and the location was great. We would consider staying at Bahama Breeze again but not so sure about staying in this unit. Few things need attention- fridge no seal on door, tv screen in master and living room have shadows defects , DVD player not playable, walls need painting, lazy river not in service. Wonderful 3 bed/3 bath condo with private balcony off each bedroom-great for couples. Carolina Resorts Realty great to deal with. Condo could use a bit of updating. When we arrived on 9/2/2017 the condo did look like pictures on this website, but the unit was nasty. Sand was still on floors, windows were not cleaned they had finger and hand prints all over them along with a few forehead marks. The tubs had pubic hair along with other lose hairs. I notified the realtor and they did send someone over, they cleaned the tubs and sweep the floors. The microwave was nasty along with splatter on the outside of the oven, just not a very kept up place. On 9/6/2017 the resort drained all the pools, lazy river, and hot tubs within two and a half hours. When we questions the resort they said it was because of hurricane Irma, now don't get me wrong I believe in preparing for stuff, but again it only took 2 1/2 hours to drain everything. Weather was beautiful until we left on 9/9/2017 and we had no outdoor activity besides the ocean which had rough under currents. Call the realtor we went through no kind of credit was offered at all, no understanding, no anything. Needless to say I will never use the realtor again...ever, no recommendations for them either or for the resort itself. The staff at the resort was VERY rude and unpleasant to be around. I would advise anyone that stays in this resort to research before you book. This is not the typical reception to this unit... We did note that we sent the guest to a unit that had not been cleaned... the housekeeper dropped the ball. We did send her back out and the guest stated they were happy with the cleaning. We very much regret anytime this happens and fortunately it does not happen often.. In terms of the pools. Unfortunately we have no control over what the on sight people do. In my estimation that was not smart to do and the weight of the water holds the pool in the ground. In the event of higher than normal tides would potentially push the pool out of the ground. The guest was without a pool for 2 and a half days of their 7 day vacation. I do note that one of the reviews from July stated "gorgeous"
Out bottom line is that we strive to remedy any issue that a guest might have and we sincerely regret when one of our guests expectations are not met... and certain are very sorry for this guests experience. The ocean view was amazing. Plenty of space for three families. The DVD player was broken. Not enough towels or wash rags and was told if I needed extras to wash the ones I had. The refrigerator took 2 days to get cold. The shower nozzle was horrible. One of the hot tubs water was just lukewarm instead of hot. The Lazy River was exceptionally nice as well as the swimming pool. The location on North Myrtle Beach was great. 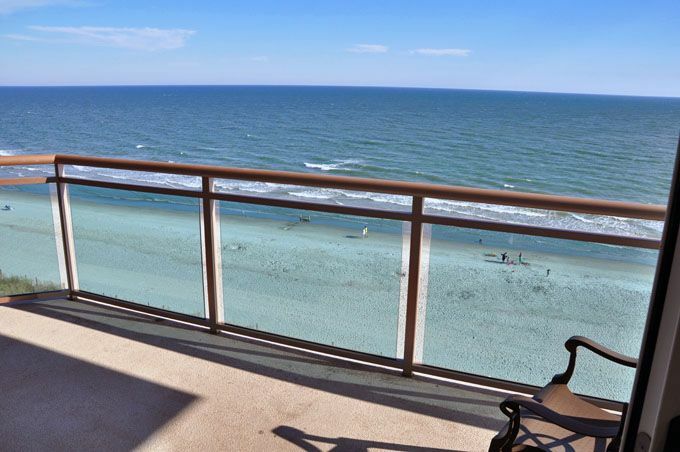 We very much regret any time that a guest does not have a great vacation experience with our company and we welcome those reviews both the good and the bad however I will add that for the most part most of our reviews are good for this condo. We are happy that overall the guest enjoyed their stay we would like to address the issue around towels. We provide 12 bath towels, 12 washcloths and 6 hand towels plus kitchen towel for this condo. This condo has a maximum occupancy of 8 persons so that leaves 4 extra towels by our count. I am not sure how many people might have actually stayed as they mentioned that they had 3 families. Regardless we are sorry for this guests perception about this condo and the level of service that we did provide. We could not have stayed at a more beautiful place! Our stay would have been almost perfect except for the following reasons: To start with we received no amenities. There was no hand soap, dishwasher detergent or any of the items listed on our paperwork. We called for extra washcloths and could not get those. We asked for garbage bags, but did not get those. My daughters went out to the beach on Thursday night to gather shells and just enjoy the beach. It was close to midnight when they decided to come back in, but they were locked out. Their keys would not work for the gate coming in from the beach. There was another family with a small child with them. There were no signs posted to advise them this gate would be locked, nor to tell them of another entrance. They had to climb over the gate. They got to the main doors, and they were locked and they could not get in to the condo. Nothing on my paperwork said anything about the doors being locked at 11:00. It said we would have access 24/7. The janitor was right inside the door. bit he ignored them! To me, there are some people employed there that are not very helpful and very rude! I did leave housekeeping a tip, but I had to think long and hard about it. My daughters would not be happy with me to know I had left a tip to someone who did not respond to our needs. As much money as we had to pay to stay at this condo, and on top of that, to have to pay extra to have linens furnished and the beds made, we should have had at least all the above. Well firstly we are happy that you liked the condo... In regards to the amenities bag we check and double check our linen bags... am not saying we are perfect but the amenity bag is most always in the bag with the linens. It is a small number of supplies with the intention that this will start you off for your stay but when you buy your groceries you would purchase the supplies you need for your stay. Our rule basically is one bar of soap for each bath, a roll of toilet tissue for each bath, 2 additional trash bags, a roll of paper towels and one pod for the dishwasher. In regard to the linen rental. Unless you rent from the onsite people and pay substantially more that we charge...linens are an up charge. We are a traditional vacation rental management company in business for 50 years... as do all vacation rental companies there are additional fees for services we provide... Lastly we are very sorry about the lack of courtesy by the onsite janitor. This is not an employee of our company. Your keys should have given you access to both the gate at the beach, as well as the lobby... Our directions to you at check in is that the doors are locked 24/7 and that the keys would have to be used to gain access to the property. Unless the onsite management now leaves doors open until 11PM which the guest seems to be saying we have not been notified of any changes. They do this so as not to have people taking advantage of the property. We have managed units in that building since it opened its doors and have fortunately to our knowledge ever have a guest to experience being locked out in this fashion. We are very sorry for this unfortunate occurrence. Weekly from $555 to $2455* and daily from $125* per night. exceptions and nightly with 2 or 3 night minimum for remainder of the year.